AS CHRISTIANS WE KNOW THE IMPORTANCE OF KEEPING OUR HEARTS, MINDS AND BODIES PURE. TEMPTATIONS TO SIN ARE ALL AROUND US. THIS IS THE STORY OF MARIA GORETTI, A TEENAGE SAINT WHO LAID DOWN HER LIFE FOR WHAT SHE BELIEVED. Maria Teresa Goretti was born on October 16, 1890 in Corinaldo, Italy. Her parents were Luigi Goretti and Assunta Carlini. Maria was the third of seven children in the poor farming family. By the time she was six, Maria’s family had become so poor that they had to give up their farm. When Maria was nine years old, they moved to Le Ferriere, where they lived in a building that was shared with another family which included Giovanni Serenelli and his son, Alexander. Maria’s father caught malaria, and died when she was just nine year’s old. With the father’s death the rest of the family had to work even harder to feed the large family. Maria’s mother, Assunta had a very strong faith and despite the hardships, she brought up the children with great devotion to love the Sacraments and she encouraged them to pray. From a very young age all her children were taught about the importance of keeping themselves pure in heart, mind and body. Maria never had any schooling and could not read or write but as a young girl, while her mother and brothers were out working in the fields, Maria, would look after the house, cooking and cleaning and she cared for her baby sister. Though it was a hard life, the family was very close. They shared a deep love and faith in God. Eighteen-year-old Alexander, who lived in the same house, had already made secret attempts to seduce Maria but she had always resisted him and she was afraid to tell anyone about his advances. One day, when twelve year old Maria was alone in the house with her baby sister, Alexander appeared with a knife in his hand even more determined than ever. Maria refused, saying that it would be a very serious sin to give in and she fought against him to keep her chastity. When Maria said that she would rather die than submit, Alexander, in a frenzy began stabbing her until family members arrived, alerted by the baby’s crying. Maria was taken to hospital, where they operated on her immediately to try to save her life. But the next day, after forgiving her attacker and while holding a crucifix she died. Alexander was arrested, tried and sentenced to thirty years in jail for murder. For a time he was unrepentant but one night he had a dream that he was in a garden and Maria was there. He said that she gave him flowers. After the dream, he repented of the killing and became a changed man. When he was released after twenty seven years behind bars he went to Maria’s mother, begging for her forgiveness. She willingly forgave him saying, “If my daughter can forgive you, then who am I to withhold my forgiveness?” Alexander later became a lay brother and lived in a monastery, working as its receptionist and gardener until he died peacefully in 1970 at the age of 87. Many miracles were attributed to Maria Goretti after her death and in 1950, at Saint Peter’s Basilica in Rome, Pope Pius XII canonized Maria as a Saint. Maria’s mother was present at the ceremony, along with her brothers and sisters. She was the first mother ever to attend the canonization ceremony of her child. 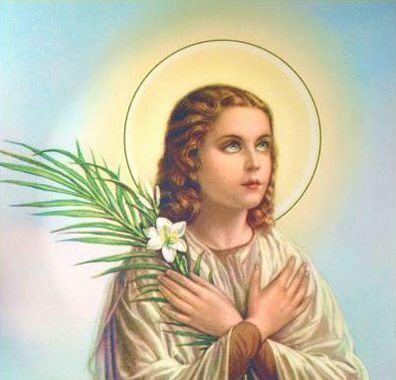 St Maria Goretti is a very popular young saint and martyr and she is a great role model for young people, as she fought to defend her purity and more importantly she forgave her attacker. Her feast day is July 6. St. Maria Goretti is the Patron Saint of Catholic youth, girls, teenagers and young people.